Jersey Boys Cracks the Top 30 Longest-Running Broadway Shows! 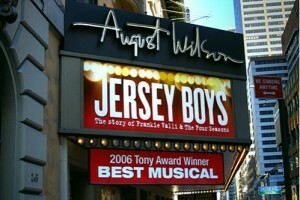 Another Jersey Boys Broadway milestone! As of July 11, 2010, the 2006 Tony Award-winning Best Musical has become the 30th longest-running show on Broadway, with 1,929 performances! Jersey Boys has now surpassed some of the long-running and critically-acclaimed shows on the Great White Way, including La Cage aux Folles, Aida, and South Pacific and will soon be closing in on hits such as Pippin and Smokey Joe’s Cafe.